Thank you for your interest in adopting one of our rescue dogs. We make every effort to match prospective adopters with a pet that best fits their lifestyles. Filling out an application does not obligate you to adopt, nor does it guarantee that your application will be approved. Please note: If you do not answer every question, your application may not be received. The first step in our adoption process requires you to complete an adoption application. You must list everyone in the household. You must be 24 years or older to adopt. There are NO exceptions to this rule. We may not respond to individual inquiries or release more specific information about a particular dog, unless we have an approved adoption application on file. Our website and Facebook pages are updated frequently and is accurate to the best of our knowledge. All pertinent information regarding a dogs personality, temperament and medical issues is provided in his biography. We do not have a kennel and all of our foster dogs are cared for by volunteers in their private homes. Because we are foster home based, there is no facility where a potential adopter can visit and “meet all the dogs." Visit our website to see all available dogs, join our Facebook page, and attend our events. We do not operate on a “first come, first served” basis. Our goal is to match our dogs to the perfect forever homes. 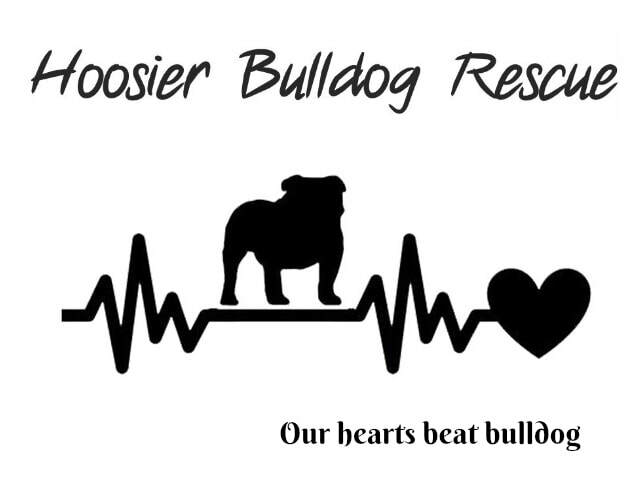 We are a private, non profit, all volunteer based rescue, which allows us to be very selective throughout the adoption process. The adoption process takes time. Please be patient. Our volunteers have full time careers, families, and personal responsibilities, in addition to their volunteer work at the rescue. Dogs are NOT surprises or gifts - if you are looking to give a bulldog as a gift to someone, then our rescue cannot accommodate your request. Please keep in mind that by the time you have submitted an application, several others have already gone through the application process and are simply waiting for the right dog to complete their family. Although you may specify a dog that you are interested in, this may not be the right match for your family. If you have small children or other animals, it may take some additional time to find just the right dog for you. Many of our dogs come from unknown backgrounds and may not do well with young children or other pets. Please be patient as we want the adoption to work for everyone involved. We do allow out of state adoption on a case by case basis. You must be willing to travel by car to adopt your new family member. We do not provide transportation and we do NOT ship dogs. If at any time the dog is found to be unsuitable for your family, it is your responsibility to return the dog safely to our rescue. "Co Applicant" is considered your spouse or significant other. You must include their information on your application. They are not considered a reference. Thank you for taking the time to complete our adoption application. Please be sure all questions have been answered. Our primary goal is to properly match the right dog to the right family, and we can only do that with a complete, honest application! By signing this form, you certify that all information provided is true to the best of your knowledge.